In the late 1960s the Soviet Union got wind of the fact that the US was working on a gas turbine power plant for its next generation tank. After some experimentation, in 1968 the Soviet goverment authorized the development of a main battle tank powered by a gas turbine engine. But immediately after testing, both the Kharkov and Nizhniy Tagil design bureaus bowed out as the test tanks were rapacious fuel users and they did not think they could meet standards. However, the Leningrad Kirov Factory, whose lead designer was now Nikolay Popov, said they thought they could meet the requirements. The only restriction was that the CC CPSU secretary for defense industrial efforts, Dmitriy F. Ustinov, said it must be based on the new T-64A tank. Popov’s team took an early T-64A and converted it to run on a GTD-3M gas turbine of 700 HP. This tank, Article 219, was not very good, and as the Nizhniy Tagil factory before them (who had been ordered to built T-64A tanks with a V-12 type diesel engine) they asked to make a few changes to the design. They also asked for a new and dedicated engine. The result was the Article 219A tank, which now had new running gear and also a new GTD-1000T engine coupled to a fluid-drive type 4-speed transmission. This worked like the old Chrysler Dyna-Flow transmissions of the late 1940s: you needed a clutch to change gears, but the tank could be halted in gear without stalling the engine. It worked better with the torque curve of the GTD engine. The tank went through numerous changes before emerging in the mid 1970s as the more recognizable one we know today. Accepted for service in 1976 as the T-80 - just as Ustinov became Minister of Defense and decided this would be the primary tank of the Soviet Army – it had the same turret as the T-64A with the cross-turret rangefinder. But it was a dog, and with the early engine could barely reach 250 kilometers on highways. The military hated it and at least one general demanded more than twice the number of fuel tankers (bowsers) would be needed just to feed it. But with the advent of the T-64B with laser rangefinder and 9K112 “Kobra” (AT-8) ATGM system, the T-80 got the same upgrades and emerged in 1984 as the T-80B. At the same time, after events in the Bekaa Valley in 1982, Soviet commanders acquiesced to fitting explosive reactive armor (“dynamic protection”) to the T-64B and T-80B, and thus the T-80BV emerged in 1985. In 1986 by sheer luck I was an intelligence analyst in the 3rd US Armored Division and looked over the Allied Military Liaison Mission photos of these new tanks, which were now appearing in the Soviet 8th Guards Army across the border in East Germany. I remarked to one of my fellow officers that if I had unclassified plans I could build a model in no time. My boss heard me and said let’s do it. I drew up three sets of plans (without, partial ERA fit, and full ERA fit) and after several weeks 7th US Army/USAREUR declassified them and I built two models, one with ERA and one without. They were used for USAREUR and NATO training posters, and photos of them appeared in a great number of publications to include Jane’s and eventually East German, Czech and Russian (!) publications. 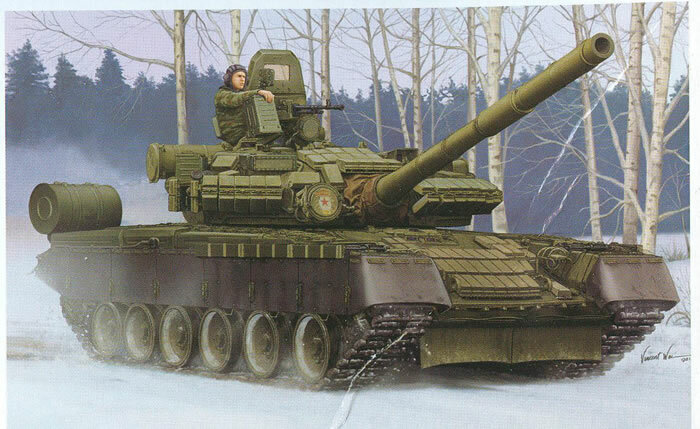 As a result I have always had a soft spot for the T-80BV. But until the last year the tank has been ill served in 1/35 scale models, with only an old DML kit based on photos and a very poor Lindberg one (cloned by Firefox from eastern Europe) and two slightly better SKIF kits. Now, hot on the heels of the Xact T-80U comes this BV from Trumpeter. Like all of the recent Trumpeter kits, this one is stunning and a bit daunting in the number of parts provided. It provides for building the T-80BV with the “nominal” fit of ERA containers – “bricks” in slang due to their shape – without the full fit for the skirts. I think the reason that configuration was rarely seen was that it was too easy to damage the skirt bricks in training, and most commanders wanted to ensure they could use them in combat. If I remember rightly, a full fit is 211 bricks on the skirts, glacis and turret of the tank. In Step 4, a large number of holes must be drilled in the glacis (from the inside) to accommodate the glacis ERA bricks. Note that the exhaust grille for the hull (part G28) is a styrene part; while some would have preferred etched brass, the actual grille is a bar-type assembly and this is a better representation (but does have some flash to clean out). Step 9 is the track assembly, and as with many Trumpeter kits there are separate links and guide teeth. They do provide four handy assembly jigs for assembling the lengths of track. One track run is listed at 80 links, and there are about 184 complete links provided in the kit and 8 spare links in brown. In Steps 11 and 12 you have a choice of skirt; the first tanks were fitted with attached “footloops” (actually they were handles for moving the front skirt sections but worked either way) or the later ones with the footloops cut into the skirt material. Your choice. Both sets come with the stud bases for the full ERA fit if you have an after-market set and wish to install all of the bricks. Trumpeter only provides the “above the fender” strip of 9 bricks per side. In Step 13 Trumpeter would have you install the unditching log (S3) in the brackets for it that were installed in Step 3. Given those are made from etched brass this may not be the best approach, and it may be easier (and more solid) to try and fit them all at the same time. Turret assembly starts in Step 15. While the snorkel assembly for the OPVT system is pretty straightforward, note that each of the angled ERA brick arrays on the turret are made up of six parts with an etched brass bracket (PE-B8) holding them at the proper angle. There are also five different sets of bricks so a great deal of care will be needed in fitting them to the turret shell. At least there are no holes which need to be drilled in the turret. The only part of the kit I found curious was the OPVT snorkel intake trunk, which on the original T-80BV consisted of two sections of a plenum that fitted together and had a pipe connecting them. One was solid but the other had a mating collar to fit the snorkel intake tube. This kit comes with the plenum but has an intake opening in both of them. One is sealed and one is open, so it could have been a later fit to the vehicle. Very late models mounted the plenum on the end of the snorkel tubes, but as with earlier ones the kit mounts them on the right rear of the turret. Step 17 covers the assembly of the mantlet. While Trumpeter provides two of them, one at zero elevation and one at roughly three degrees elevation, so far I have not seen any difference with either one, but think the actual elevation permitted is about a degree and a half. Step 19 covers the commander’s cupola and NSVT machine gun mount. There are 53 parts to this assembly - and it is a manual mount, not the 1EhTs29 remote control one on the T-64 or T-90! Four different finishing schemes are provided: three-color (dark green/black/sand) modern Russian, bort number 41, Guards badge on searchlight cover; three color (dark green/white/light brown), bort number 703 and Russian flag flashes; three-color (dark green/black/white), bort number 210; all over “Protective Green”(Soviet era), bort number 410, unit insignia, Guards badge. A sheet of decals is provided with all markings. Overall this is a very impressive kit and far in advance of the one I scratchbuilt in 1986.